We’re back with more benchmarks! 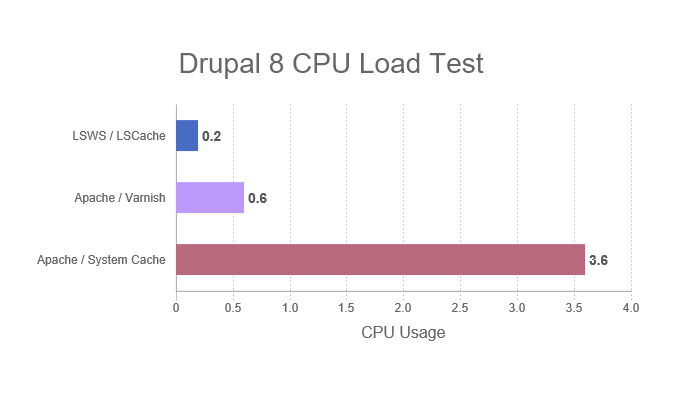 This time, we’ve put our new LSCache module for Drupal 8 to the test. We compared LiteSpeed Web Server with LSCache, Apache with Varnish (Cachewall), and Apache with System Cache. 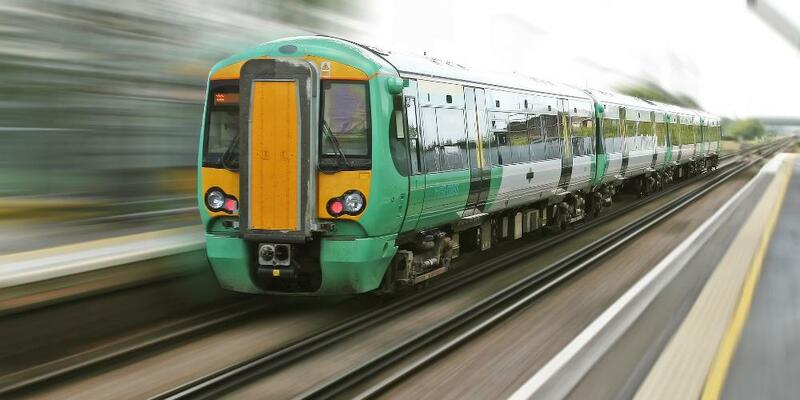 Our testing consisted of burst tests and load testing, both of which are explained in more detail below. The following chart shows how many requests per second each server + cache solution combination processed during our burst tests. The larger the number, the better. As you can see, LiteSpeed Web Server + LSCache outperforms both Apache + Varnish and Apache + System Cache. The following graphs show the CPU and Memory usage during testing for each server + cache solution combination tested. For these measurements, a smaller number is better. 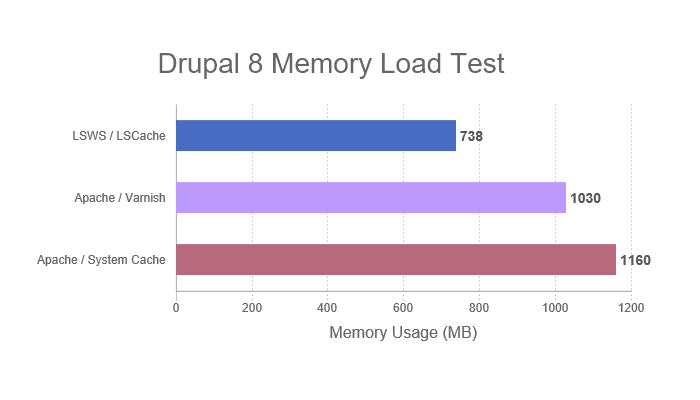 LiteSpeed Web Server + LSCache consumed less memory and CPU than both Apache tests. You can see the specs of our configuration and test environment below. Feel free to run the same benchmarks yourself and verify our results. NOTE: We used -d 6 instead of -b in two cases because we wanted to ensure that each server+cache was processing roughly the same number of transactions per second. The -d parameter allows you to specify a delay. 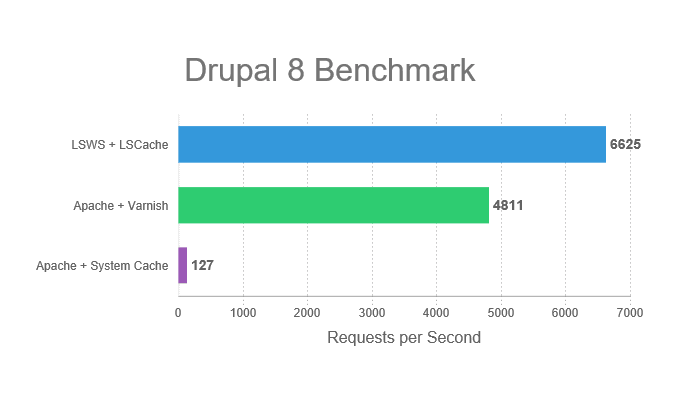 We hope these results encourage you to give LSCache for Drupal 8 a try! If you run into any trouble or would like to share some feedback, drop by our forum. We’re here to help! And don’t forget, our Slack community is a great place to connect other LiteSpeed users. Check out the #drupal-cache channel while you’re there.